Remember the old almond joy commercials? No not that nut ones, but the ones that went “You can share half and still have a whole” In this blog, I'll show how sharing half of stock market gains can be a really sweet deal. 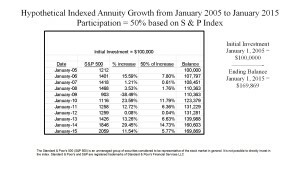 One of the most popular conservative investments available is an FIA - Fixed Indexed Annuity. The interest credited to these products is often based on the performance of some external equity index. However, since your dollars are never invested in the directly in market, you won’t lose when the market falls. (Subject to the claims paying ability of the issuing insurance company). There are several ways to determine your annual earnings on the account – caps, spreads, and for this video – participation rates. Participation rates mean that your account receives a percentage of the market gains when the market goes up and neither gains nor losses when the market goes down. 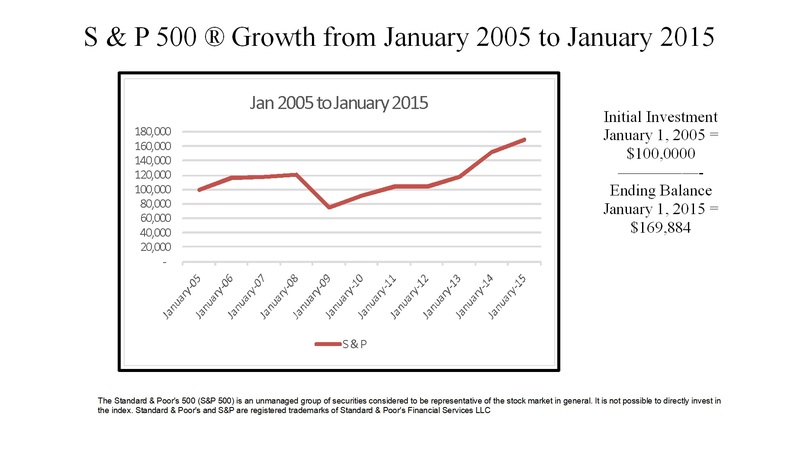 In this example, I will assume that you might have invested $100,000 in the S&P on January 1st of 2005. 10 years later your investment would have grown to $169,884. However, as you can see from the graph, it was a pretty bumpy ride. So what would have happened if you invested the same dollars in an FIA with 50% participation beginning at the same time? As you can see from the chart, in the first year the market returned 15.59% - of which your account earned half. 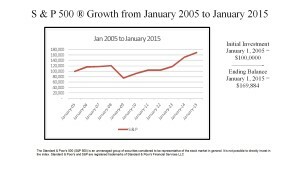 The next two years were essentially flat, but look at what happed when the financial crisis hit in 2008-2009. When the market plummeted, you didn’t gain anything – but you also didn’t lose. Your balance remained the same. Your gains were locked in at the previous year values. At the end of the 10 years, your account would have been $169,869. A line graph of the two strategies shows the power of avoiding large losses. 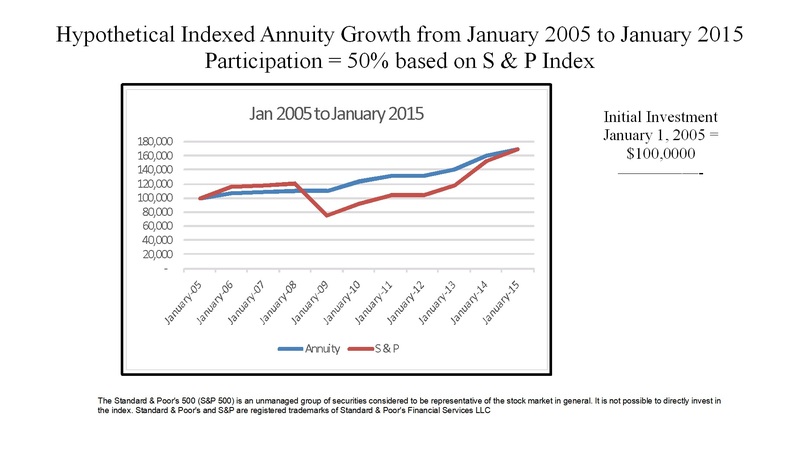 The red line is the S & P and the blue line is the annuity. Even though you only earned half of the gains, by avoiding the big losses in 2008 and 2009, you ended up in essentially the same place as if you were investing in the stock market. Naturally, I don’t have a crystal ball to predict what will happen in the future. 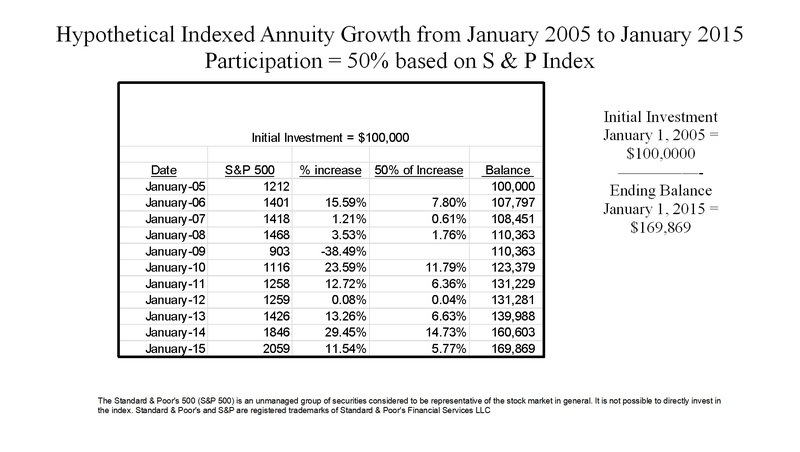 Usually, investing in the stock market will generate a bigger return than investing in an annuity. As with all investments, there are strings attached and they aren’t for everyone. That said, an FIA may be a viable option for the conservative portion of your portfolio – possibly as a substitute for bonds or CD’s. ABOUT TERESA: Arizona CERTIFIED FINANCIAL PLANNER(TM) Teresa Bear 480-503-0050 www.TeresaBear.com specializes in retirement planning and asset preservation. Teresa works primarily in the Phoenix Metro area and has offices in Mesa and Chandler. Teresa has been helping families and retirees reach their financial, tax, retirement planning, and estate planning goals for over 25 years. She is legally bound to uphold the highest level of fiduciary standards when providing investment advice to her clients. Financial Planning Areas for Arizona Investors Include: Early Retirement & Retirement Planning, Income Planning, Social Security Strategies, Tax Planning, IRA & 401(k) Rollovers, Wealth Accumulation & Investments, Life Insurance, Annuities, Long-Term Care, Financial Planning for Women, Transition Planning (due to Job Change, Job Loss, Retirement or Moving to Arizona). 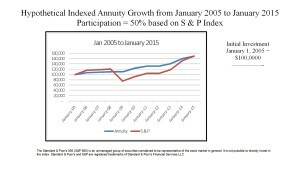 AZ Retirement Strategies: Does Peer Pressure Motivate Us?